To be considered pure, a silver coin must be created from 99.9 percent pure silver. Silver is a metallic chemical element that bears the chemical symbol "Ag" (Argentum). This precious metal, with an atomic number of 47, is used to make jewelry, tableware, silverware and coins. A typical silver coin is required by the currency standard to contain 90 to 99 percent silver. 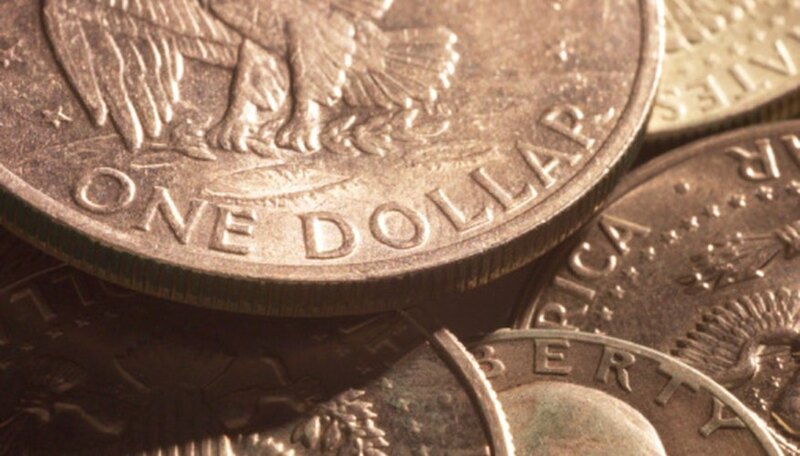 Commonly circulated coins are usually an alloy composed of 90 percent silver with 10 percent copper added to increase their strength and durability. Pure silver coins are extremely valuable and highly sought-after by collectors. The U.S. Silver Eagle coin has been in circulation since 1986. This coin has a face value of $1 and comprises one troy ounce of 99.9 percent silver. The obverse side features an Adolph A. Weinman design from 1916 that depicts "Walking Liberty"; the design was used on Walking Liberty half-dollars between 1916 and 1947. The reverse features a heraldic eagle with a shield and 13 five-pointed stars, designed by John Mercanti in 1986. They are the only silver bullion coins guaranteed by the U.S. government. A total of 130 million bullion U.S. Silver Eagle coins have been sold since 1986. The Canadian Silver Maple Leaf coin was first minted in 1988 and is now considered to be one of the more popular of the Canadian Maple Leaf collection of bullion coins. This coin contains one troy ounce of pure .9999 fine silver, making it the purest one-ounce silver coin produced by any government mint throughout the world. The Silver Maple Leaf is currently a circulated, legal tender coin within the country of Canada, maintaining a value of $5 Canadian. The obverse of the coin portrays an image of Queen Elizabeth II, while the reverse features the easily recognizable image of the Canadian maple leaf. The Mexican Silver Libertad has been in circulation since 1982, and since that time has depicted the phenomenal "Angel of Independence," an eight-ton golden statue delicately situated atop a tall slender column in Mexico City. The heads' side of this coin features Mexico's national coat of arms, an eagle battling a snake. The design is surrounded by a wreath inscribed with the words "Estados Unidos Mexicanos." The coin is created from 99.90 percent pure silver and is available in a variety of sizes, ranging from .5 oz. to 1 kg. The Australian Silver Kookaburra has been in circulation since 1990 and is produced annually, featuring an ever-changing design. This coin is considered to be one of the world most popular silver bullion coins because of its distinctive designs and high-quality production. The Kookaburra coins are distributed through the Perth, Australia Mint. These coins are created from .999 percent fine silver and are issued in four popular sizes, 1 oz., 2 oz., 10 oz. and 1 kg. In 2007, the high popularity of the Australian Silver Kookaburra coin led the Perth Mint to create the similarly animal-themed Silver Koala coin.